The All In One WordPress Security and Firewall is the ultimate security plugin that will take your WordPress site’s security to a whole new level. This security plugin offers the latest recommended WordPress security practices and techniques as easy to use features. It is designed and written by experts with the user in mind. You don’t have to learn complex htaccess rules to apply good firewall rules to your site anymore. WordPress is already a secure platform in the way it is designed but the common security holes and issues found in most WordPress websites usually come from careless users or bad security practices, poor hosting configuration and poorly coded plugins or themes. Therefore it is very important to add some extra security and firewall to your site by using a plugin such as this one which enforces many crucial security practices on your site. All In One WP Security and Firewall also uses an unprecedented security points grading system to measure how well you are protecting your site based on the security features you have activated. The security and firewall features are categorized as “Basic”, “Intermediate” or “Advanced”. This allows you to safely enable a group of security features without breaking functionality of your site as soon as you activate the plugin. All of our security features and firewall rules are categorized into “Basic“, “Intermediate” and “Advanced“. The features which fall under the basic category are generally non-invasive and will not break any functionality. These types of features should be activated immediately in order to provide you with the minimum security you should be applying to your site. The features which fall under the intermediate and advanced categories can break certain functionality depending on your setup and which plugins you are using. These types of features usually apply more complex security measures. Using our feature classification system you can easily activate features and apply firewall rules progressively without breaking your site’s functionality. 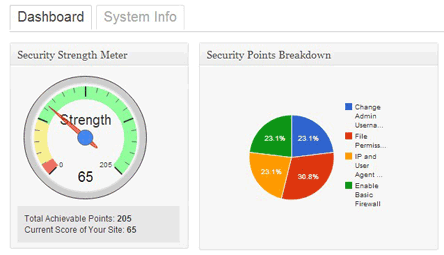 In the dashboard page you will find a security strength meter gauge. The purpose of this gauge is to keep you informed of how secure your site is based on how many of the available security features you have applied to your site. This is done using our security points system which will calculate your current security score out of a maximum achievable total score based on which features you have activated or applied. The dashboard will also highlight the most important features which you should apply to your site to achieve a minimal acceptable level of security. These are displayed in a panel which also shows whether they are currently active or not. Read the full set of feature list on the WordPress security plugin page. 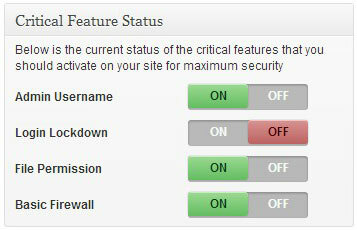 This security plugin should work smoothly with most of the popular WordPress plugins. Works with the latest version of WordPress. Download the All In One WP Security & Firewall Plugin. Some of the intermediate and advanced features can break your site if they conflict with another plugin or theme on your site. Some of these advanced features may not work correctly on your site if your hosting provider’s configuration doesn’t support it also. So a good strategy is to get started by enabling just some of the basic security features in the plugin. Then use the plugin for a few weeks to see how you go. Once you feel more comfortable with the plugin, you can start to think about using the intermediate or advanced features. It is very important to backup your site before you activate an intermediate or advanced feature. If you have activated a feature and something went wrong, use the resources/links listed under the Helpful Troubleshooting Links section of this page to deactivate the plugin and then reset your htaccess file to get your site back to a sane state. You can also restore your site from a backup. Bookmark this page for easy access in the future. Q. I enabled various firewall features from this security plugin but now I am locked out of my site. How do I fix it? A. Restore the htaccess file of your WordPress site. This will remove any firewalls and allow you to start from the beginning. Q. I enabled maintenance mode and now I am locked out of my site. What should I do? Q. I have a WordPress Multi-site (WPMS) install. I do not see some of the menus of this plugin on my sub-sites. Why is that? A. WordPress multi-site uses one single file system for all your sub-sites. So some of the security features only need to be enabled on your MAIN site. The sub-sites won’t show you the menus for these features. You can configure those settings from the main site of your WPMS install. Q. Is there any recommended hosting? A. The plugin should work on any properly configured servers. However, it is a good idea to get a good WordPress hosting (if you don’t have one).